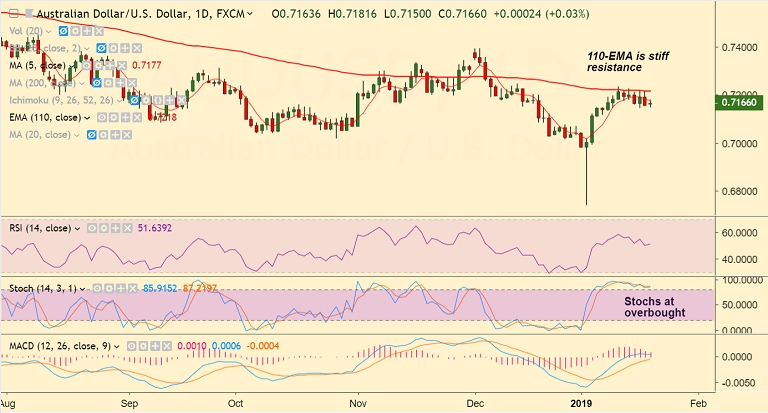 AUD/USD edged higher on early Monday's trade, rose around 20 pips on the back of an above-forecast China industrial production data. China's industrial production rose to 5.7 percent year-on-year in December, a big beat on forecast of 5.3 percent. However, the major is struggling to extend gains on poor China's Q4 GDP print, which came in at the lowest level since early 2009. China's Q4 GDP came at +6.4% y/y, inline with estimates, down from 6.5% previous. The q/q reading for Q2 stood at +1.5% vs +1.5% expected and +1.6% last. PBOC and the Chinese government are unlikely to introduce a flood-like stimulus to support the ailing economy and investment is likely to struggle to accelerate from its current pace. AUD/USD trades with a neutral bias on the daily charts, major trend remains bearish. Price action is holding support at 21-EMA, break below to see further weakness. Break above 110-EMA required for upside.